Apple hardware is of excellent quality, with some exceptions. In particular, I consider the iMac a prime example of engineering and design... except for the original keyboard and mouse, which I replaced with a generic USB 105 keys keyboard and a generic USB wheel mouse for this review. Additionally, since my original rev. E Blueberry iMac still had just 64MB of RAM, I decided to give it a boost by replacing its RAM with a single 256MB PC-100 SDRAM stick. The new keyboard, mouse and RAM came in at less than USD 45. The original 6.3GB hard disk is adequate for this review. Small, silent, cute and available in many garage sales: the iMac Blueberry. I have just checked: used 350MHz iMacs are available on eBay these days for something like USD 200, sometimes with a lot more RAM and upgraded hard disks. You can find the full specifications of the 350MHz iMac on the Apple website or here. In October 1999, its performance could be considered mid-range. But Apple has moved on since, and modern iMacs are different in design and much faster. I was wondering whether my 4 year old iMac would run KDE 3.1 at all, or even at half-decent speed. So after downloading and burning the two ISO images for Mandrake PPC 9.1 Beta 2, I verified that the hardware was still functional and reinstalled MacOS 9.0.4 on an HFS partition (Linux cannot read/write HFS+ partitions yet, AFAIK), leaving more than enough empty space (4.2GB) for Mandrake Linux. Whereas booting from a cd-rom usually requires a change to the CMOS settings in a PC, for the iMac one can just keep the "c" key pressed after a power-on or reset (another hint: keep the mouse button pressed if you need to eject a CD). Yaboot, the OpenFirmware bootloader, is similar to Grub or LILO in functionality and looks. In this PPC 9.1 Beta 2, one is given a choice of boot images, leading to different versions of the installation program. As I found after repeated attempts, the text-only version was the only one that worked for my iMac: I got a blank screen with the other choices. I confess I used the little reset button on the side of the iMac more than a few times at this stage. Installation, once under way, was rather uneventful. In fact, the installation on the iMac was extremely similar to the installation on my Athlon box: I tried to choose the defaults to avoid wasting time with untested options. The same warning that I made concerning the x86 Mandrake 9.1 Betas applies here: if you are a beginner, do not attempt the installation of any Beta Linux distribution on your machine, including the Mandrake PPC 9.1 Betas. And even if you feel confident about it, make a backup of all your data before you get started. Screenshot 1: With a little bit of GUI tweaking, here is the KDE 3.1 desktop on my iMac. I tried all the usual applications: Konqueror, KMail, KSnapshot, Mozilla (which takes a few seconds longer to start compared to my Athlon box), the Gimp, KWord, etc. The iMac ran (almost) everything without a single problem. Unfortunately, the OpenOffice programs refused obstinately to display their menus correctly. 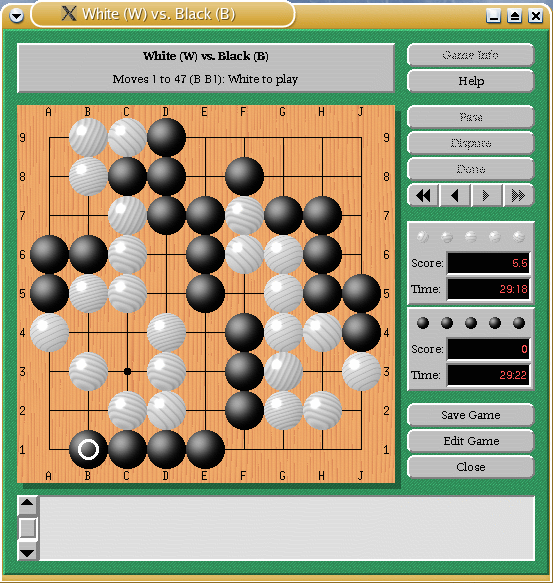 Screenshot 2: GNU Go playing against itself. Note cgoban does not use antialiasing. The iMac did not feel slow at any time during my testing (this is a totally subjective opinion, but I have low tolerance for unresponsive systems). Sure, my 1.4GHz Athlon XP with DDR 333 SDRAM feels faster, but the difference in performance was much less than I expected. To me, this was a good surprise: I thought I had a computer destined to my private electronic cemetery, but I have changed my mind. 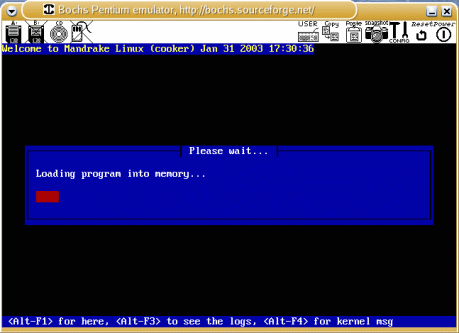 I'll have a fully functional backup GNU/Linux workstation when Mandrake releases the final version of Mandrake PPC 9.1. I am not going to make side-by-side comparISOns between MacOS 9/ OS X and Mandrake Linux PPC 9.1 Beta 2 or even final. These comparISOns are not very illuminating at best, and completely misleading at worst. The idea here is that practically any Mac user will be able to install and use Mandrake 9.1, a modern GNU/Linux distribution. MandrakeSoft is even including an SMP-enabled kernel in CD1 of this PPC Beta 2! Hardware support in Linux is basically determined by the kernel. Mandrake PPC 9.1 Beta 2 uses a stable 2.4.20 kernel with a good degree of hardware compatibility and full iMac support. For example, plugging in an EagleTec 32MB USB Flash Disk in the available USB port resulted in the proper kernel modules being loaded, and the device being recognized by the hotplug mechanism and auto-mounted as /dev/sda1 on /mnt/hd. The same applies to my external USB 2.0 hard disk (used in USB 1.1 mode, since the 350MHz iMac has two USB 1.1 ports). Both devices showed transfer rates around 700 KB/s. Network support was configured during the installation and worked out of the box, as did the video and sound peripherals. The hard disk is used in UDMA 33 mode, and I was given the choice to configure X in various resolutions and color depths (1024x768x24@75Hz works well). The installation procedure also recognized the internal modem and offered me the option of configuring PPP for Internet access. 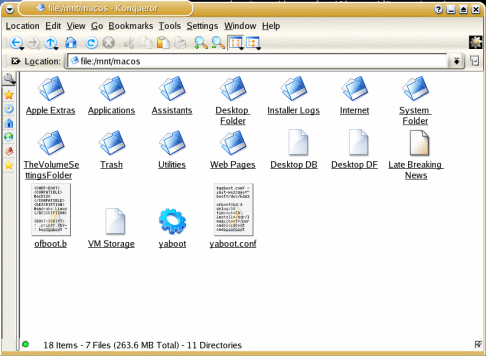 Screenshot 3: Konqueror browsing the MacOS 9 HFS partition. My only complaint is really with the sound driver: I had the impression that all sounds were reproduced with an excessive amount of noise, and when I later manually installed the game Frozen-Bubble, the sound driver would periodically hang on a certain sound, a very annoying bug. 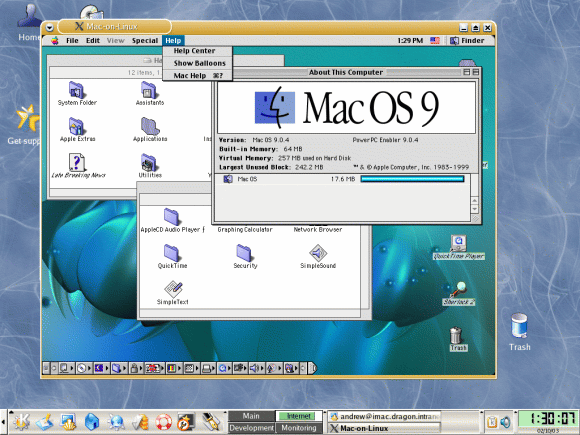 Screenshot 4: MacOS 9 in a MOL window on my KDE 3.1 desktop. Since Mandrake PPC 9.1 Beta 2 includes a rpm for MOL, installation was a snap. The documentation states that MOL can also boot Linux PPC inside the virtual machine, but because MandrakeSoft did not include the kernel sources in the Beta 2 CDs, I could not recompile the kernel for MOL support. Screenshot 5: The little iMac accepted just about any job I could throw at it. Screenshot 6: Mandrake x86 9.1 Beta 3 installing on an iMac - thanks to Bochs! The development of Mandrake Linux PPC 9.1 is taking place in parallel with Mandrake Linux x86 9.1. 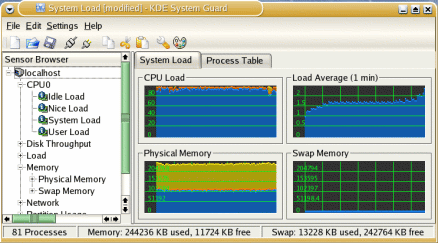 The choice of packages on the two CDs of Mandrake 9.1 PPC Beta 2 was similar to that in Mandrake Linux 9.1 x86 Beta 2, down to the absence of KCalc, the KDE calculator, as noted in one of my previous x86 9.1 Beta reviews! There is a lag of a few days between x86 and PPC versions, which may or may not diminish for the next Betas and RCs (Release Candidates). Taking a look at the Cooker directories, one can see that the PPC developers at MandrakeSoft are keeping pace with the mainstream x86 packages. Are these two separate distributions? For a Linux user, they are the same distribution in two different flavours. Ideally, one should be able to switch from one to the other and not feel any difference, and I would say Mandrake 9.1 is close to reaching this ideal. On the other hand, stability for some packages was better in the x86 Betas. Similarly to the x86 9.1 Beta 2, I found a few easily solved issues with font rendering, too. All in all I would expect this PPC flavour of Mandrake 9.1 to display the same improvements during the development cycle as the x86 one. There are just a few more bugs that need to be ironed out (some of which are not under the control of MandrakeSoft). Imagine an office with various servers and networked workstations, with a mix of x86 and Apple machines, old and new. Wouldn't it be practical to use a single OS and GUI throughout, add a Linux File/Print/Firewall/Backup/DNS/DHCP/whatever server and manage the entire network remotely? This is basically what MandrakeSoft will be able to provide with these two flavours of Mandrake Linux 9.1, and I doubt any other OS but GNU/Linux would fit the bill within similar constraints of cost and ease of setup. I found the usual KDE and GTK+ Office and Internet applications (with the exception of OpenOffice 1.0.1) to be extremely usable under Mandrake Linux PPC 9.1 Beta 2, on my admittedly low-end iMac. The quality of Apple hardware and free (as in freedom, not as in beer) software combined add up to a powerful, cost-efficient, easy to setup and maintain combination. 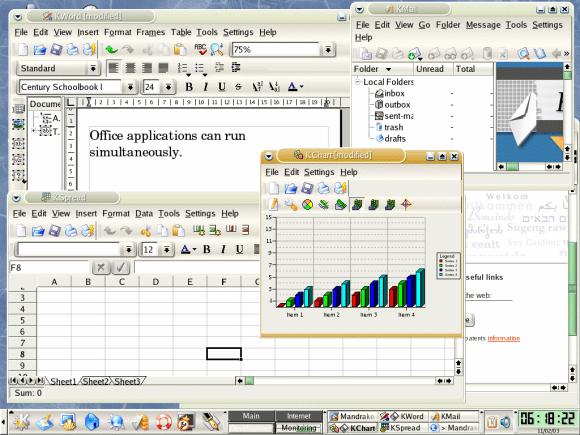 Screenshot 7: KWord, KSpread, KChart, KMail, Konqueror and more. My little Blueberry friend is back to the network! Surprisingly I found the transition from my Athlon Linux box to the iMac uncannily easy. There are advantages and disadvantages to each workstation. The Athlon is faster and gives me exactly twice the screen real-estate. On the other hand, the iMac is compact and totally silent. And honestly, in everyday applications, the small difference in perceived speed is irrelevant. So I guess Mandrake Linux PPC 9.1 has permanently found a home on my iMac's hard disk. Apart from the particular circumstances of this review, I am curious to see how Mandrake Linux PPC 9.1 will do on the market when MandrakeSoft starts shipping it, probably in April. I certainly found this PPC 9.1 Beta 2 to have a great appeal and I believe the potential is there. If Mac users are willing to experiment, why not try Linux for a change? There could be a surprise! Identical to Mandrake Linux x86 9.1 Beta 2 in terms of looks. Combines good-looking, quality hardware with free, good-looking, quality software. Tracks the development cycle of x86 9.1 quite closely, so I expect a more complete selection of packages for Beta 3 and later. 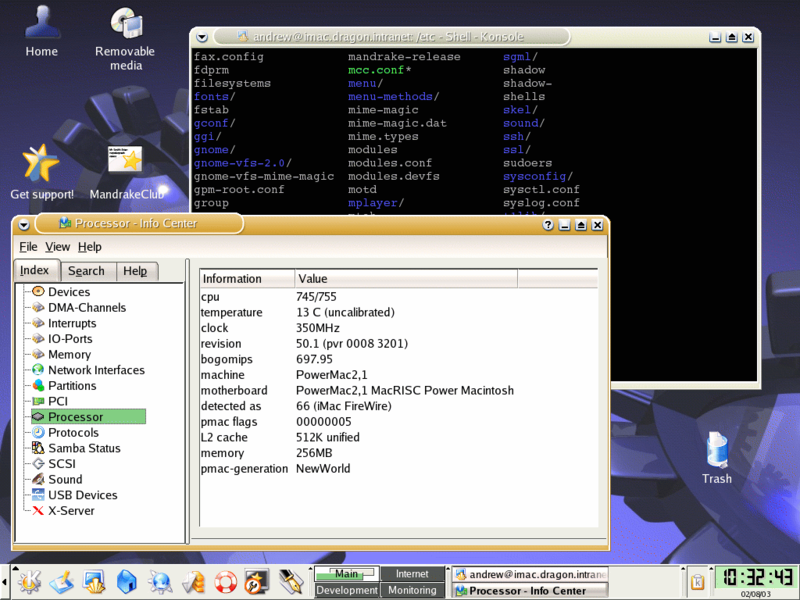 Really cool Mac-On-Linux virtual machine. Graphical installation did not work on my iMac. Small bugs detract from general impression of stability and usability (note however this is an early Beta, where such bugs can be expected). Kernel source not included (MandrakeSoft developers, are you listening?). Andrew D. Balsa is a Linux software developer and I.T. consultant based in Hong Kong. He is also the author of the Linux Benchmarking HOWTO.